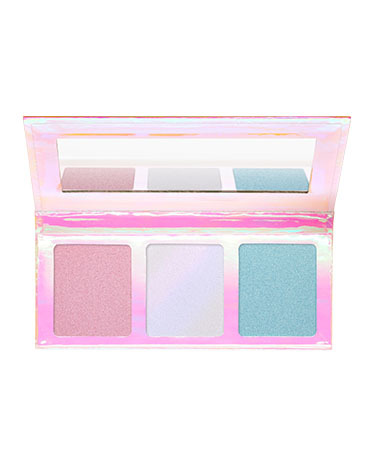 go for the glow highlighter palette has a rating of 3.0 stars based on 1 reviews. 01| INGREDIENTS: TALC, MICA, SYNTHETIC FLUORPHLOGOPITE, MAGNESIUM STEARATE, DIMETHICONE, ETHYLHEXYL PALMITATE, POLYISOBUTENE, SYNTHETIC WAX, CAPRYLIC/CAPRIC TRIGLYCERIDE, PARAFFINUM LIQUIDUM (MINERAL OIL), TIN OXIDE, DIETHYLHEXYL SYRINGYLIDENEMALONATE, ETHYLHEXYLGLYCERIN, BHT, BUTYL METHOXYDIBENZOYLMETHANE, ETHYLHEXYL METHOXYCINNAMATE, PHENOXYETHANOL, CI 77491, CI 77492, CI 77499 (IRON OXIDES), CI 77891 (TITANIUM DIOXIDE). AND/UND INGREDIENTS: TALC, SYNTHETIC FLUORPHLOGOPITE, MICA, MAGNESIUM STEARATE, DIMETHICONE, ETHYLHEXYL PALMITATE, POLYISOBUTENE, SYNTHETIC WAX, CAPRYLIC/CAPRIC TRIGLYCERIDE, PARAFFINUM LIQUIDUM (MINERAL OIL), TIN OXIDE, DIETHYLHEXYL SYRINGYLIDENEMALONATE, ETHYLHEXYLGLYCERIN, BHT, BUTYL METHOXYDIBENZOYLMETHANE, ETHYLHEXYL METHOXYCINNAMATE, PHENOXYETHANOL, CI 77891 (TITANIUM DIOXIDE). AND/UND INGREDIENTS: TALC, MICA, MAGNESIUM STEARATE, SYNTHETIC FLUORPHLOGOPITE, DIMETHICONE, ETHYLHEXYL PALMITATE, POLYISOBUTENE, SYNTHETIC WAX, CAPRYLIC/CAPRIC TRIGLYCERIDE, PARAFFINUM LIQUIDUM (MINERAL OIL), TIN OXIDE, DIETHYLHEXYL SYRINGYLIDENEMALONATE, ETHYLHEXYLGLYCERIN, BHT, BUTYL METHOXYDIBENZOYLMETHANE, ETHYLHEXYL METHOXYCINNAMATE, PHENOXYETHANOL, CI 42090 (BLUE 1 LAKE), CI 77007 (ULTRAMARINES), CI 77491, CI 77492, CI 77499 (IRON OXIDES), CI 77891 (TITANIUM DIOXIDE). 02| INGREDIENTS: TALC, MICA, DIMETHICONE, MAGNESIUM STEARATE, PENTAERYTHRITYL TETRAISOSTEARATE, ISOPROPYL ISOSTEARATE, SYNTHETIC WAX, CAPRYLIC/CAPRIC TRIGLYCERIDE, PARAFFINUM LIQUIDUM (MINERAL OIL), DIISOSTEARYL MALATE, ETHYLHEXYL STEARATE, TIN OXIDE, DIETHYLHEXYL SYRINGYLIDENEMALONATE, ETHYLHEXYLGLYCERIN, BHT, BUTYL METHOXYDIBENZOYLMETHANE, ETHYLHEXYL METHOXYCINNAMATE, PHENOXYETHANOL, CI 15850 (RED 7 LAKE), CI 77491, CI 77492, CI 77499 (IRON OXIDES), CI 77891 (TITANIUM DIOXIDE). AND/UND INGREDIENTS: TALC, MICA, SYNTHETIC FLUORPHLOGOPITE, DIMETHICONE, MAGNESIUM STEARATE, PENTAERYTHRITYL TETRAISOSTEARATE, ISOPROPYL ISOSTEARATE, SYNTHETIC WAX, CAPRYLIC/CAPRIC TRIGLYCERIDE, PARAFFINUM LIQUIDUM (MINERAL OIL), DIISOSTEARYL MALATE, ETHYLHEXYL STEARATE, TIN OXIDE, DIETHYLHEXYL SYRINGYLIDENEMALONATE, ETHYLHEXYLGLYCERIN, BHT, BUTYL METHOXYDIBENZOYLMETHANE, ETHYLHEXYL METHOXYCINNAMATE, PHENOXYETHANOL, MAY CONTAIN/[+/-]: CI 15850 (RED 7 LAKE), CI 77007 (ULTRAMARINES), CI 77491, CI 77492, CI 77499 (IRON OXIDES), CI 77891 (TITANIUM DIOXIDE).